Taste cava, the distinctive pink and white sparkling wines of the Catalonia region, on a private 4-hour tour from Barcelona. 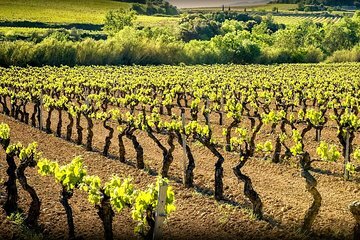 Explore the vineyards of one of the world’s largest producers of cava, ending with a flight of their specialty wines, and then walk it off on a short tour of central Catalonia. Travel through the country by train with your guide. Meet your guide in central Barcelona and travel through the countryside by train for roughly two hours until you reach Sant Quintí de Mediona in the Penedès. Begin your private cava tour at Freixenet, one of the largest cava producers in the world whose origins date to 1861. Learn about the cava production process from grape to glass on a tour of the premises, concluding with a train ride through their cavernous underground facilities and a flight of house-selected cava varieties. Then, take a short walking tour through central Catalonia and see some of the 80 wineries that call the region home. Complete your tour at the Cava Welcome Center, where you can explore their exhibits and take a hands-on interactive journey through the history and culture of Penedès and the Catalonia region. After, return to Barcelona by train and conclude your tour back at the original starting point.